This practice coverage agreement package is intended for established coverage groups or an assembly of up to 10 doctors who are seeking to create a coverage group. For single doctors, click here to view the individual doctor package. In order to minimize the devastating effect of death or disability on an orthodontic practice and the orthodontist’s family, we have developed a Practice Coverage Agreement. The practice coverage agreement is designed to anticipate and deal with the challenges that a doctor's death or disability can bring, providing a step-by-step approach for maintaining and successfully transitioning the practice to another orthodontist as quickly, efficiently and profitably as possible. The booklet is not a legal document, but it does offer a variety of general information to help ensure the smooth and profitable transition of an orthodontic practice under any circumstances. There is an assortment of letters and suggested language to use with patients, parents, referring dentists, suppliers and insurance providers if this situation arises within your orthodontic practice. The booklet will provide a peace of mind for a timely and smooth transition to occur for the wellbeing of your staff and patients. 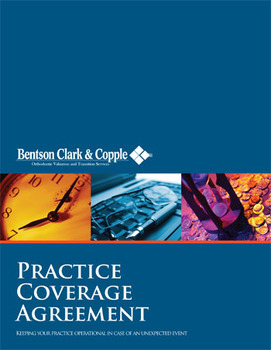 Up to ten (10) copies of Bentson Copple & Associates' Practice Coverage Agreement. A one-hour one-on-one phone consultation with a Bentson Copple & Associates representative to guide you through the coverage process (a $295 value). A one-year subscription for each group member to the Bentson Copple reSource, Bentson Copple & Associates' business-oriented quarterly newsletter (up to a $950 value).